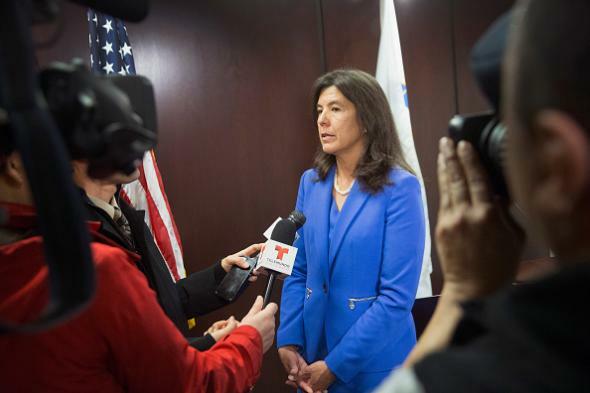 Chicago prosecutor Anita Alvarez won't reopen cases of possibly innocent convicts investigated by officer Reynaldo Guevara. Cook County State’s Attorney Anita Alvarez on April 20 in Chicago. Here’s a big story from BuzzFeed: The Cook County, Illinois state’s attorney’s office will not reopen the cases of four men convicted in part because of a controversial police officer named Reynaldo Guevara despite the conclusion of an official investigation that they are most likely innocent. The existence of the investigation, commissioned by mayor Rahm Emanuel and conducted by former U.S. attorney Scott Lassar, was publicly known, as was prosecutor Anita Alvarez’s decision not to reopen the cases—but BuzzFeed has obtained a court-sealed copy of the investigation and reported for the first time that it concludes that three of the convicts are “more likely than not” innocent and that one “more likely than not” did not shoot the man he was convicted of shooting. The four men are Roberto Almodovar, Robert Bouto, Jose Montanez, and Armando Serrano. The police officer who links their cases, Guevara, also investigated two men—Juan Johnson and Jacques Rivera—who have already been freed in high-profile wrongful-conviction cases. Chicago paid $15 million to settle a lawsuit that Johnson filed after he was retried and acquitted.